3. Storage drawer (left and right). 4. Lateral air vent (left and right). 5. Side window demister vent (left and right). 6. Loudspeaker (Tweeter) (left and right). 8. 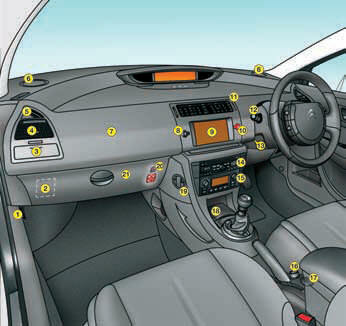 Control for central locking of doors and boot. 13. Steering column adjustment lever. 14. Radio-CD or NaviDrive radio navigation. 15. Air conditioning or heating/ventilation. 17. 12-volt accessory socket (150 W max). or USB socket. • Passenger’s airbag activation/ deactivation.